We, in general, love meat. Every kind, prepared in every way. If you’re vegetarian, this post clearly is not for you. Beef is king. Ground sirloin or chuck, flank steak, skirt steak, NY strip, sirloin, tenderloin, ribeye, top round… whatever cut you choose, prepared correctly, is delicious. Everything else is fair game. Prime beef is highly select and really quite rare, and the only time it’s really worth the money is when you want to cook a naturally lean piece of meat, or a piece of meat that derives its flavor from fat content. Like tenderloin or ribeye. The other grades are choice, followed by select. 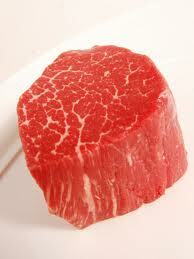 Kobe beef from the wagyu species of cow is highly prized due to its incredible marbling and natural tenderness. Something like a shortrib (chuck) or skirt steak would really showcase the meat. Then you have grass fed vs corn fed, Nebraska CAB (certified angus beef) vs California, brandt beef vs Bolivian or Argentinian… the subtle differences between varieties is massive. Does it all make a difference? Does any of this matter considering the supermarket is going to supply only a couple varieties anyway? What about wet vs dry aged beef? You should always be aware of what you’re putting in your body. Hormone – free beef does, in my opinion, taste better. Cheap, unmarbled slabs of top roast will always be tough and flavorless no matter how long you braise it, whereas cheap, unmarbled cuts of tenderloin will still be delicious. Beef, with the exception of ground beef, should always be aged. It’s natural enzymes tenderize and flavor the beef, lending a flavor that cannot be replicated. Restaurants choose beef on a wide variety of criteria, with money/quality/profit being their base. A massive banquet hall will market their beef as ‘prime’ rib, and sure as the sun will rise, it isn’t prime quality. Believe me, I’ve been in this industry for a while now. If the price per plate is low, there’s a good chance you’ll be getting over-salted select beef. A good steak house, especially in West Los Angeles or NYC, however, will use prime quality, and you’ll pay for it. Outside the restaurant world, you can buy prime grass fed beef at high end butcher shops, or local gourmet markets (and sometimes places like whole foods). But, for the most part, you won’t. You walk into your normal grocery store and do what most restaurants do: look for quality vs price. Let’s say you find a good deal on a bone-in rib roast, choice or even select quality, and want to create that high-end prime beef experience at home. Can it be done? Prime beef can never be replicated 100%, but this trick will come as close as you can. The key: time and temperature. This technique will slowly tenderize the meat, giving you very little water loss, and resulting in a perfect mid-rare from the outside right to the center. It takes time, but it’s worth it. 24 hrs before roasting, lightly coat the beef with the oil and aggressively rub the garlic into the meat. Cover the meat with plastic wrap, refrigerate and let rest for 24 hours. Not only will the olive oil/garlic flavor permeate the beef, but the natural acidity from the garlic will also begin the tenderizing process. It’s easy and is the best marinade I have ever had for beef. 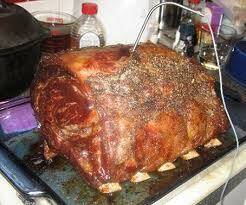 2 hours before roasting, remove meat from the fridge and let come to room temp. Heat over to 180. Scrap all the garlic from the meat and discard. Thoroughly and liberally salt and pepper the meat. Place the meat on an elevated roasted rack or perforated pan (this allows the dry heat to impact all sides). If you have one, insert a wire-thermometer into the center of the meat. Place the meat in the oven and cook for about 7 hours, or until internal temp reads 115. Remove from oven. Turn oven to 500. Place meat back in oven and let crisp. When the meat is beautifully browned and crisp, remove, turn oven off, and let meat stand for 15 minutes. Carve and serve right away. Best served with mashed yukon potatoes, all varieties of roasted vegetables, au jus, casseroles, and anything else wonderful with beef.